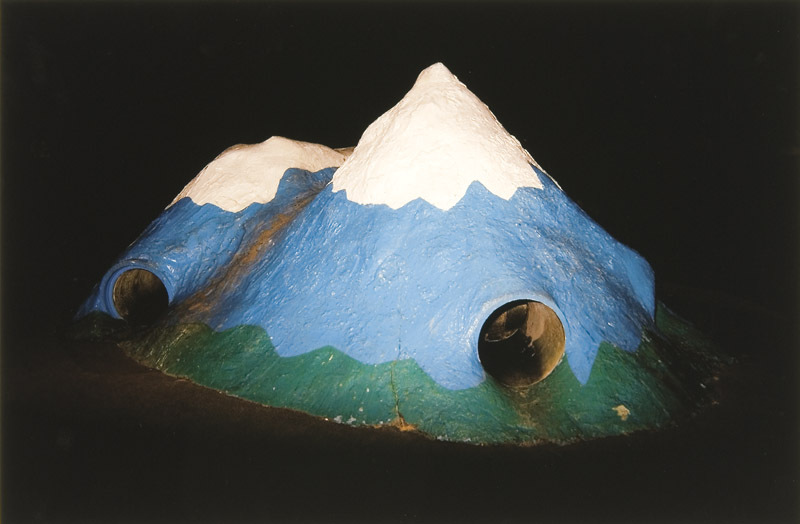 Leigh Mitchell-Anyon, Night sites #8, 2003. Collection of the Sarjeant Gallery Te Whare o Rehua Whanganui. Working as a Collection Transition Assistant at the Sarjeant Gallery Te Whare o Rehua Whanganui I have had the opportunity to see a majority of the Gallery’s collection during the move to our temporary location at Taupo Quay. I have the privilege of sharing some of my favourite works in the exhibition Pale Rider currently showing at Sarjeant on the Quay. Pale Rider focuses on photography, one of the Sarjeant’s collection strengths, as well as a few works in other media. When forming the concept for this exhibition I was drawn to works that relate to explaining the natural world via folklore and myth, ideas around the afterlife, and explorations of the unknown. This was sparked by my personal tie to Mt Taranaki and the stories that connect it with the Whanganui River. The mountain was always a kind of totem for me growing up under its presence. The myth that resonates strongest with me is when Taranaki, after his defeat by Tongariro, gouges out the land as he heads towards the setting sun, his tears filling the deep scar left behind to become the Whanganui River. Those tears can become torrents, with the recent flooding a reminder of nature’s power and unpredictability. Photographs by Frank Denton and Wayne Barrar in the exhibition show a flooded Whanganui in 1940 and 1990 respectively. In the lithographs by Tony Fomison spirits and legends inhabit the New Zealand landscape, such as Papatūānuku out in the cold waiting for the pines to go home. In versions of the Māori creation story Papatūānuku (earth mother) is locked together with Ranginui (sky father) in a tight embrace. Their children live cramped in the darkness between them until their son Tāne (god of forests) prises them apart with his powerful legs, separating earth from sky and bringing light to the world. In these stories, Papatūānuku still yearns for the warmth of Ranginui. The separation between earth and sky is also prominent in the group of photographs by Laurence Aberhart taken from the Whanganui River mouth. The line of the horizon is only broken by the silhouette of Mt Taranaki in the distance. Shot in the fading light of dusk the long exposures produce photographs that appear to have captured aeons of time. Also included in the exhibition are works from Leigh Mitchell-Anyon’s Night Sites series showing Whanganui after dark. The title Pale Rider comes from Clint Eastwood’s supernatural western film of the same name and references the rider of the pale horse Death, one of the Four Horsemen of the Apocalypse. It also becomes an omen for the men walking the pale horses in Dr Edward Wilson’s Exercising the Ponies, Cape Evans, Looking North, August 8, 1911. 3pm. The title itself shows the detail and accuracy the artist was known for in his role as scientist on Captain Scott’s ill fated ‘Terra Nova’ expedition in Antarctica. Pairs of dogs dance into the afterlife in Tom Kreisler’s Dancing Dogs I. Based on funeral ceramics found buried in Mayan tombs, the Mexican hairless dogs depicted accompanied their masters along the road of the dead. One dog is believed to be young, the other old. Some claiming they are not dancing but fighting a struggle between life and death. Others say the old dog is imparting wisdom, transmitting the knowledge of life to the younger dog.